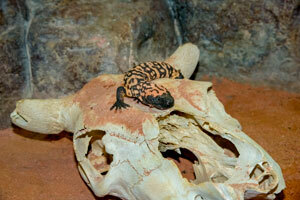 The Zoo welcomes two Gila monsters to the Aquatic and Reptile Center. They arrived from a private breeder and are unrelated. Chimichanga has the orange tail tip, while Quesadilla has the black tail tip. Ringing in at about 9 months old, 8 inches long and 2.5 ounces respectively, these youngsters are adjusting well at the Zoo. The Gila monsters are expected to roughly triple their length as they grow. These Gila monsters love to eat mice, currently receiving two mice twice a week! As the Gila monsters grow older and become adults, their feedings will decrease, as they start to store fat in their tails and require less food. Even though the Gila monsters are young, the two have very different personalities. Quesadilla, the larger of the two, is very calm and does not startle easily. Chimichanga is quick to hiss and puff up its body at any noise or movement. Enrichment for the two Gila monsters has included simple changes in their enclosure. Once the zookeepers know more about the lizards’ likes and dislikes, they will begin trying new forms of enrichment. Gila monsters have a very good sense of smell, and zookeepers plan to use different scents for enrichment in the future. The Gila monster is one of two venomous lizards in North America. It is the largest lizard native to the U.S., and it tends to adjust its behavior according to the temperature. A large portion of Gila monster habitat has been cleared for agriculture, roads and canals. As such, in 1952 the Gila monster was given legal protection, marking the first legal protection given to a venomous animal in North America. After roughly 25 years without Gila monsters on exhibit, the Zoo is excited to have these lizards again. Recently out of quarantine, stop by and say hello to the growing Gila monsters at the Aquatic and Reptile Center!